Quickly and easily assemble panels and other devices with the latest Panel Fasteners from Keystone. These new Nylon Key-Hole fasteners firmly secure to equipment and panels. The one piece design of these fasteners allows them to be installed and removed without the need for tools and reused without the possibility of missing parts. 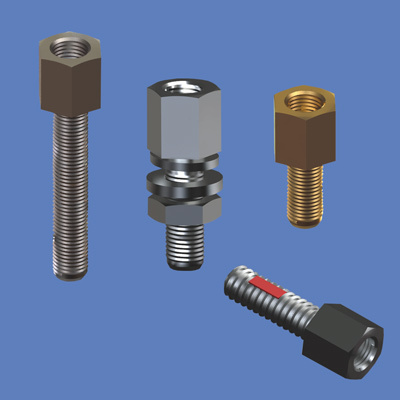 These fasteners are designed with a bullet tip for superior panel alignment during assembly. Manufactured with a tapered locking shank for tight within panels and a domed head for a clean finish on any panel. Key-Hole Panel fasteners are supplied in black Nylon 6/6 material in 3 head sizes (.250", .312" and .344"). Available sizes can accommodate panels from .093" to .312" thick. Steel and Stainless Steel Jack Screws primarily used to secure D-Subminiature connectors in computer cables and other electronic equipment. Ideal for use in OEM or replacement hardware applications. Standard hex head designs are manufactured with a 4-40 thread and available with a Clear Zinc or Yellow chromate finish on the steel versions. Supplied in bulk or as a kit with flat washers, lockwashers and hex nuts. Knurled Turnable Jack Screws - Direct access, straight knurl and slim line configurations.